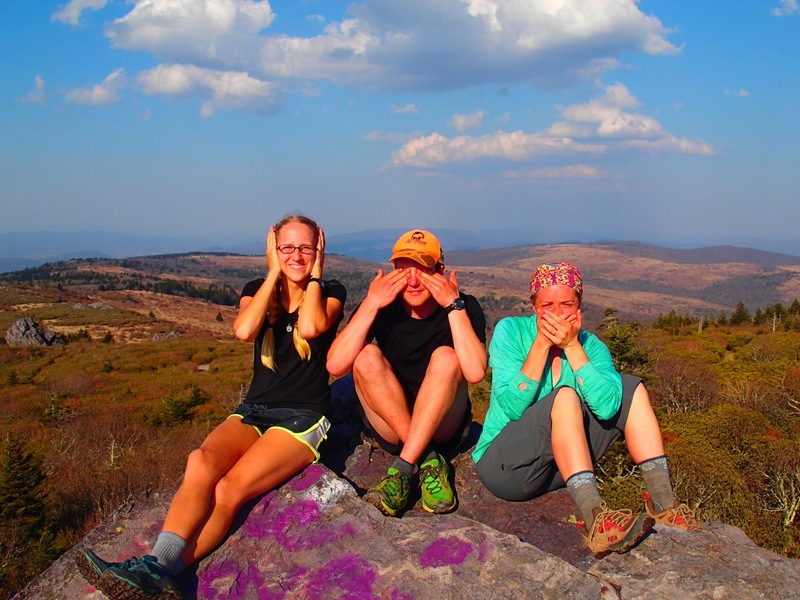 We get a good early start and I have a van load of injured hikers, our merry band is nicknamed “Captain Nomad and the Rangers” or “Nomad and the Gimps”, we get to Elk Garden Pass and I anxiously wait for the group so I can jump back on the trail with my friends. 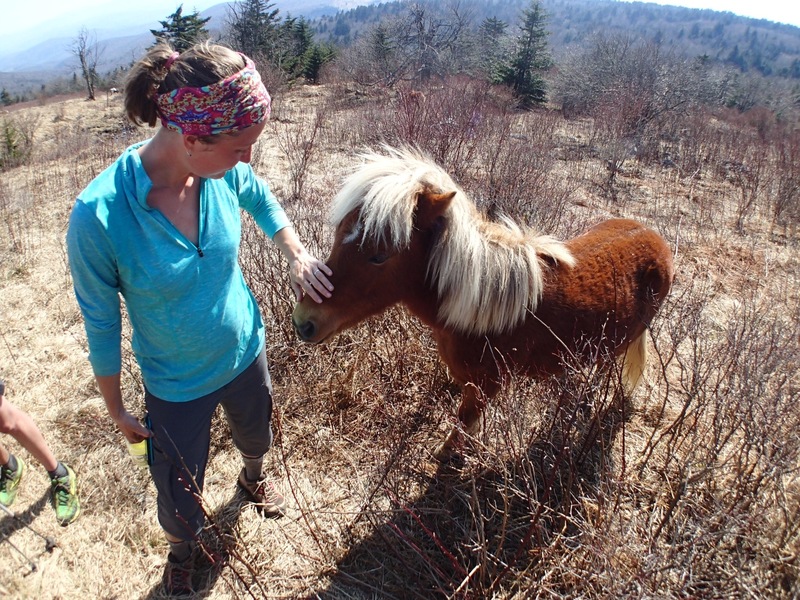 I will hike thru the Grayson Highlands, a part of the trail I was looking forward to seeing. I am excited to hit the trail again even if it is only for a day and a half! We got lots of hikers in for our lunch set up and although we see a lot of familiar faces, as we pace our bubble of hikers, we see a few new faces as well. 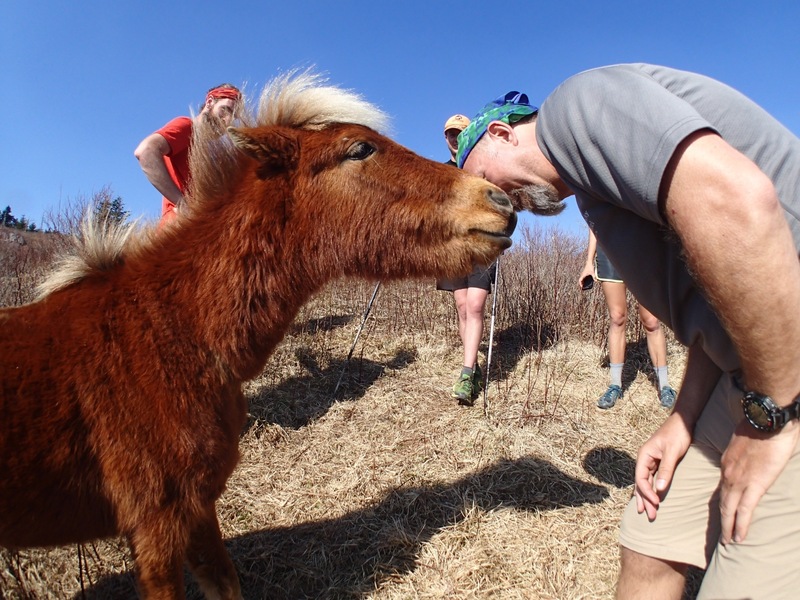 My extended family of hikers is growing and we now greet each other with hugs…despite the smell! I get on the trail with my buddies and they let me set the pace, when you are on the Nomad Train, you are not moving too quickly! We get into Grayson Highland State Park and we are all excited to see the wild ponies. It is a beautiful spring day and the sun is shinning…it is one of the nicest days I have experienced on the trail. Tom (Long Spoon formally Dry Spot) keeps joking about saving his wild pony that he calls Gaylord. As we approach the first shelter about 4 miles in we see several ponies down in a field. Tom is already down there as we drop our packs and head down…he is feeding “Gaylord”. The ponies are used to humans and probably used to being fed, so two of them come walking up…we pet and feed them then they start licking the salt off our arms and legs. It is weird but not an unpleasant feeling to be licked by a wild pony, in fact it’s somewhat therapeutic. We walk up to the shelter and Camaro is there alone, her Achilles’ tendon is hurting and she doesn’t want to push on…we have already decided to go to the next shelter just over 5 miles further down trail. She doesn’t want us to leave, and I know how she feels, we are like a small family and like to be together. Cassandra (Wide Load), EJ (Pass Over) and I hit the trail followed a little later by Alex (Ember) and Chris (Moose). I enjoy the late afternoon hike and we stop for some pictures. We hike a little further past Wise Shelter and find camp sites by a loud stream. We cook our dinner and the rest of the gang comes rolling in, including Camaro! We eat and talk, I see the stars clearly for the first time since starting the trail. We all hit the sack and I am enjoying my tent with my summer bag and not cold at all…tomorrow I have a 7 mile hike to where my van will be parked, we will continue the trail magic then I will drive Joe the Hiker to an airport, stop back in Damascus to pick up shoes I ordered for Witch Doctor then meet up with Ayce and his girlfriend on Friday…it was certainly nice to not have to worry about anything but hiking for one whole day!! We get a good start in the morning and it is another beautiful day, these are the prettiest days i have had on the trail! we have a pretty easy 7 miles and we are taking our time and walking an easy pace. Cassandra and I head out early knowing they will all catch up with us. its nice to just hike and talk and i mention how this would be a great park to take some students hiking so they can experience part of the trail. a few miles in the rest of the group catches up and we have a nice hike down to the gap to meet the van. When we get down the van is not there…they start joking that my crew has mutinied and drove off in the van, in reality they just went for ice! After feeding some more hikers we load up and head back to Damascus to drop Chickadee off, Shutter Bug is coming with us…it is hard for her to watch the hikers come down off the mountain and not to be able to hike out with them. I know this is difficult, I stopped hiking willingly, obeying God’s will, and I am envious every time I see them. I can only imagine how much harder it is when you were forced off the trail by an injury. Shutter Bug has decided to go back to Erwin, where she got off the trail and rest for a few more days before hiking again. As much as I miss my navigator I am praying that she is healed and can start her hike again. We drop her off at Uncle Johnny’s and we see some hikers that we have not seen in weeks. These are the hikers who got stuck in Gatlinburg by snow and then later stuck between Hot Springs and Erwin with a stomach virus that was going around. I meet up with Brad (Gyro) again who I had not seen since Fontana the day before entering the Smokies, I realize that this is where I would have been if I would have zeroed another day like Brad. Joe the Hiker and I stop in Johnson City for dinner then I drive him to the airport. I head back to Damascus and stay the night with my new friends Fidget and Dot Com, who graciously invited me into there home. We stay up late talking about the people and magic of the trail then call it a night. I get an early start and head back into the mountains to pick up the remainder of my merry crew, they camped up by the Highlands and we had hard rain so I am hoping they are fine. I stop at Mojo’s for a smoothie and run into Kensey and Chin Strap, who I have not seen since the smokies. Kensey has decided to get off the trail and go to Veterinarian School, she is going to drop out in Atkins on Wednesday and is wondering if I can meet her and give her a ride into Marion. I’m picking up Joe the Hiker on Tuesday and taking him back to the same area so I tell her it will not be a problem. I get my smoothie, buy some cinnamon rolls for my crew and start driving thru the rain to pick them up, they are all sleeping in the big tent I bought to shelter hikers from the rain when they stop for food, this past night would be an excellent test of how well it holds up. They are comfy and warm in the tent and get treated to cinnamon rolls in “bed”, then we break down the tent and camp, back up the van and head into Marion. I text Ayce in town and he meets us for lunch, his girlfriend will be arriving tonight, but a lot of the flights have been delayed or canceled due to storms and he is anxious to whether or not she will make it in. We see some hikers walking thru town and go out to greet them and find out that most of our gang will be hitting Mount Rogers Visitor Center in a little bit so we drive the 6 miles up the road to meet them, Ayce has not seen them in about a week and looks forward to greeting them. We park and see most of our group headed our way, I am able to give Witch Doctor his new shoes and then we talk about getting everyone into town…I don’t have enough room so Chris and Cassandra make their own way in. Everyone gets food and then restock and I start shuttling hikers back to the visitor’s center where they are camping near the trail. I end up making three trips and on the last one I bring up some apple pie, ice cream and Promise Land Midnight chocolate milk (if you haven’t tried it you really need to). During all this hiker chaos, Ayce is not sure that his girlfriend is going to make it past DC and I lend him my computer so he can try to make other flight arrangements. I tell him that if we have to we will rent a car and take a road trip to pick her up, the prospect actually gets me excited but he is able to make the flight arrangements. I’m a little bummed so he promises me we will make a road trip together in the future…I am holding him to that one! After I’m done shuttling, Ayce and I go to dinner then head back to his motel to watch a movie on the computer which now does not work, I will return it when I’m back in Johnson City. I don’t want to waste money on a room so I crash in the van for the night. I’m normally always up with the sun these days and this morning is no exception. I go into town to do some laundry, buy more supplies and organize parts of the van. When not in a trail town I get some funny looks in a van that is covered with over 50 signatures. After wrapping up the laundry I go up to Mount Rogers Visitor Center to pick up G where she stayed the night and then we head back to meet up with Ayce and his girlfriend Maria. We all decided to go to the trail head and see if we catch our group going thru Atkins. We decide to have lunch at The Barn, a little dive off the trail, we leave a note on a tree to meet us at the barn. Now the funny thing here is that Ayce got his trail name for a popular hiker acronym and one we all look for when we get to towns…AYCE: All You Can Eat. When he made the sign he used his trail name so the group would know it was us, it read: “COME TO THE BARN – AYCE” we thought it was funny that any hiker coming thru who didn’t know Ayce would assume that The Barn was an all you can eat restaurant! We enjoy lunch with our friends again and G and I get ready to leave. A few other hikers come in and we say hi, Car Jacker needs new shoes and asks for a ride into Marion, we take him to a shoe store then back to the trail. We then head back to Damascus and stay with Crazy Larry, he has been really good to me. We run into Crow in Damascus, he had hitched in from Hampton, his shoes are just about completely worn out so I give him the boots I had been hiking in which should last him another 500 miles. He needs to get back to Hampton so we give him a ride and decide to set up our magic on Dennis Cove Rd, we I had been about a week or so ago. We drop Crow off at the trail head and now I’m back in Tennessee, I can’t seem to escape this State! I have out a 1000 miles on VANIMAL and I can’t seem to stay north of the TN/VA line! 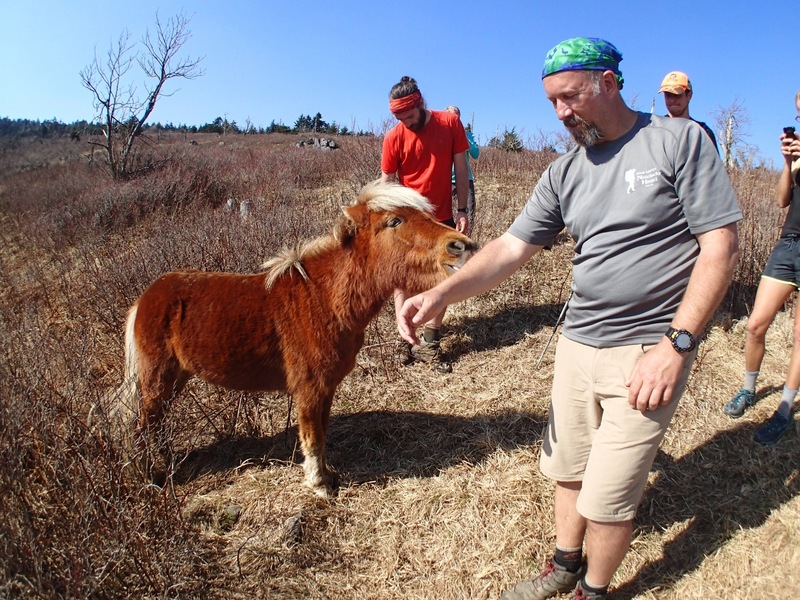 After feeding some hikers and shuttling a few around, we stay at Kincora Hostel ran by Bob Peoples, we meet some new hikers: Dumbledore, Grasshopper, Chef, Meadow Flapjack, And Northern. We hang around and talk and then call it a night. I had heard that two hikers I had not seen in almost a month are at another Hostel 11 miles south and I put a message through to them saying hi and that I would call in the morning. I’d give to you a day just like today” sounds a little sappy but I really get where he probably was when writing that song. This trail is a gift daily, whether it is raining or the sun is shinning…the people, the trail…it can be so comforting and I feel l have found serenity. Northern drives VANIMAL down to Hampton to go to the post office and pick me up after my run. When we get back up to Kincora we are just hanging out and in walks Heart Rock, I had not seen him since Sassafras Shelter just north of NOC. He is hanging with another hiker named Tall Boy, who ends every sentence with “Bo!” …like…”Shoot Yah bo!” Heart Rock and I catch up, he has heard about what I am doing and thinks it is cool, every thru hiker has plans to come back and do trial magic…it is just a natural transgression from hiker to server. I call Scotty at the other Hostel and he puts me through too Heart Burns and Sugar Gnome. Sugar Gnome was the first actually thru hiker I met on the approach trail and I met Heart Burns my second day of hiking…I have not seen either of them since Franklin when I was sick with vertigo. I pick them up at Brown’s grocery and we head to Arby’s for lunch. Today my trail magic will be about serving these two and I take them to a store to resupply and then up to Kincora Hostel, where they will stay the night. Both are having some knee problems but they are pushing through! We pack up the van and head to Johnson City to pick up my generator, resupply and get ready for some trail magic the next day. We will stick around this area for one more day and then pick up Joe the Hiker at the airport. I had also gotten a call from Camaro, she has tendinitis in both feet and Chevy is limping, after picking up Joe we will go get Them as well. I treat G to a nice dinner at Chili’s and make friends with the serving staff. I talk to the hostess about being on the trail and pursuing dreams, she says she always wanted to work as a dive instructor or something in the industry but is reluctant to follow her dreams, I try to encourage her and get her email so I can keep in touch. The one thing the trail has taught me for sure is to dream and then pursue those dreams…that’s what everyone out here is doing! Another early start, we are going to hit a gap a few days up trail from Hampton and where we were set up on Sunday. I was here a week or so ago and it is a good location. We get a few last minute things and head into the mountains. 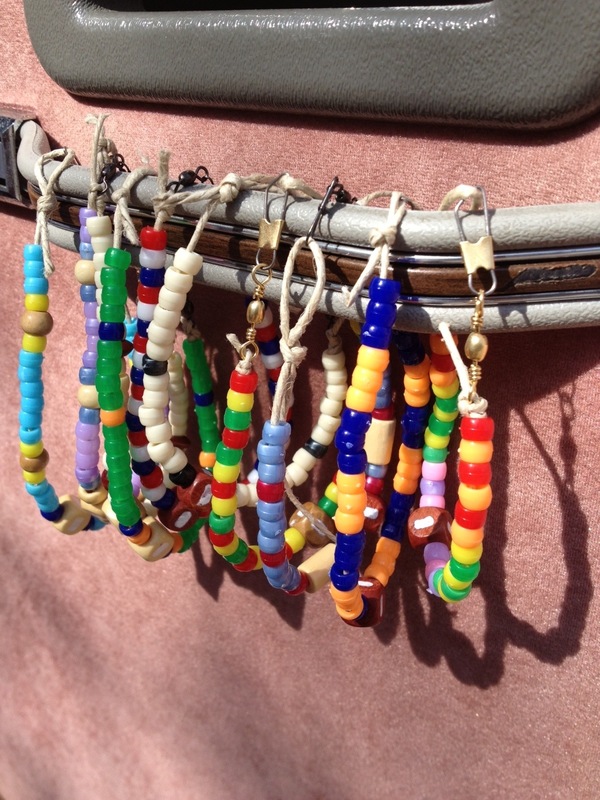 We had the idea yesterday of making bead bracelets to hand out to hikers. We are using small plastic colored beads and then painting a white blaze on a larger wooden bead. Yup…it’s art and craft time on the trail! We set up at Low Gap and about 30 minutes later we get our first hiker, he sees us from up above and literally runs down the mountain to get to us! His name is Maineiac3, he had two other friends that used the same trail name before him. He is hiking with four other that are doing what they call the “Damascusathon” trying to reach Damascus today (they had done 11 miles to our spot and had 15 to go! Shortly after in comes Movie Star, Duffle Miner, Jean Genie, and Rainbow Braid. They hang out, eat some food and our the first to get our new white blaze bracelets. Shortly after they leave a lone hiker walks in named Cody Coyote. He is doing a yo-yo, which is basically walking 2180 miles and then turning around and walking back. He did a southbound last year got to Mount Springer on March 12th, stood there, then literally starting walking back north! 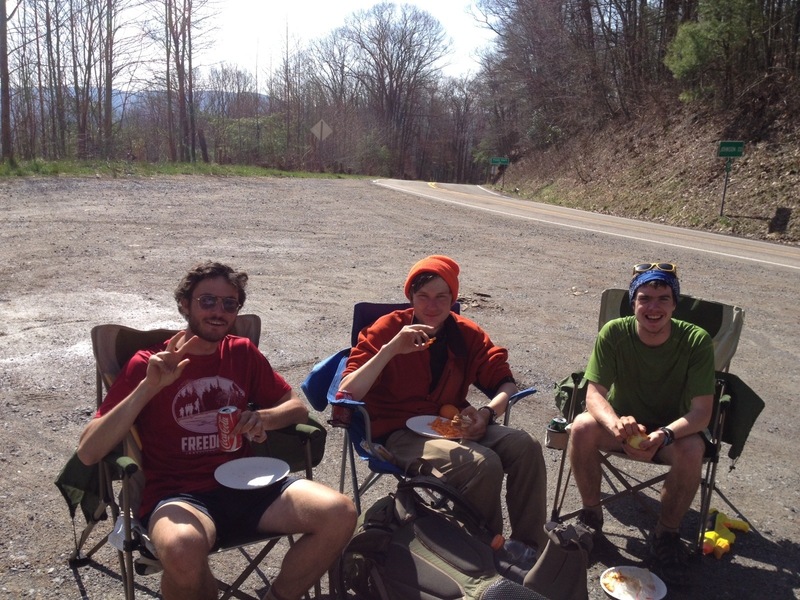 We get a few more hikers in: Northern, Meadow Flapjack, Steak and Shake. They are our last costumers and they eat their fill! 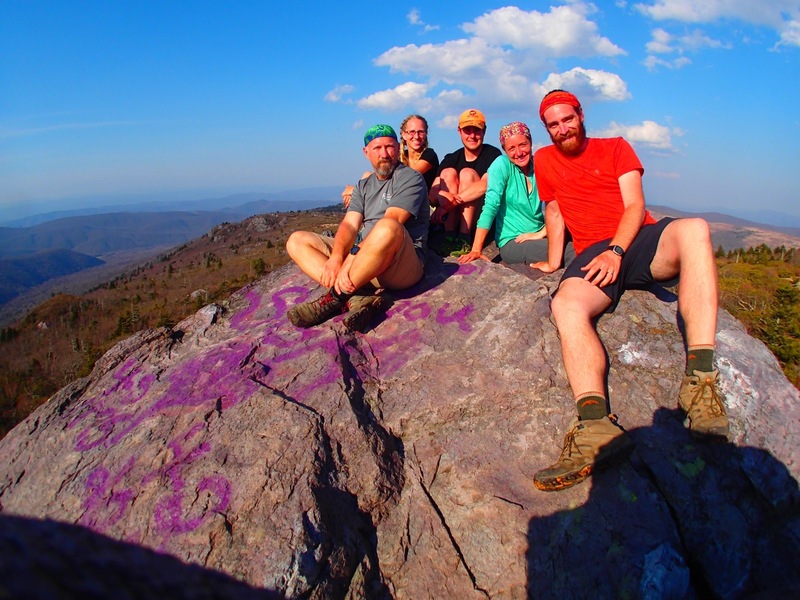 What we are starting to notice out here is that there are two big bubbles of hikers, my group who are steadily making it thru Virginia and the bubble that got stuck in the smokies and/or sick between Hot Springs and Erwin. Everything else is small groups walking between the bubbles (of course there could be more out there, especially south of Erwin but I have no way of knowing). 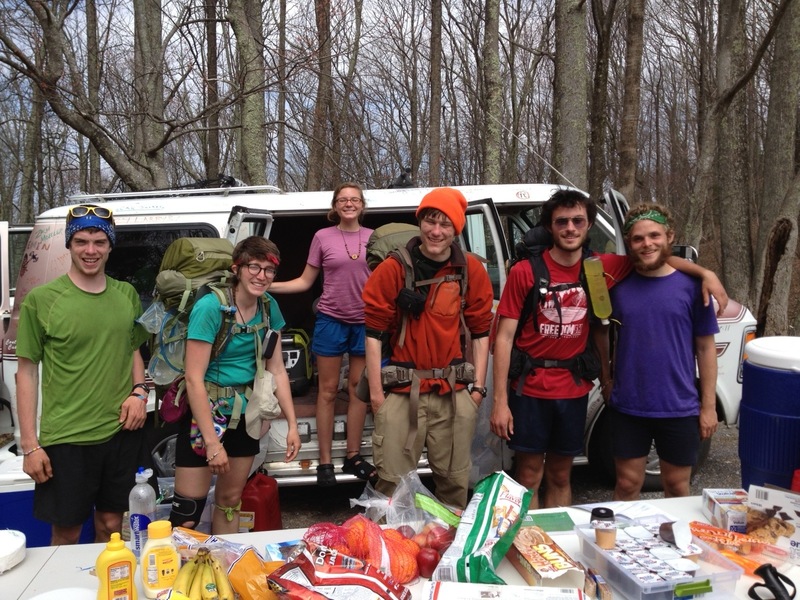 I don’t think we will see any more hikers today and we will organize the van and head for the airport to pick up Joe. I talked to Camaro today and told her I would pick her up this evening. G has decided to hang in Damascus so she can get back on the trail and Fidget and Dot Com are gracious enough to let her stay with them. A few days back when I was staying there myself they had said that they wanted to use there house for ministry and provide a place to stay for injured hikers, looks like they will start this year! We run into Little Engine and Timber who are from Austin. They actually met working as lifeguards at Rattan Creek pool, the pool in my neighborhood! I drive to Bland and meet the trail angel that Camaro is staying with, HolyBegeebers and her husband. We visit for awhile, discuss the truth of monkey heads in jars and then I’m allowed to crash on the couch. I love the trail and the communities that surround it! So tomorrow I will get all my hikers where they need to go and then it will be just me…and of course Chevy!! Thank you so much for your enlightening stories and photos! We really appreciate your friendship towards Chris and Cassandra! Hopefully we’ll see you next weekend. I am LOVING the beard… Keep it rollin’, I want duck dynasty when I see you next.